Daily Illuminator: One Munchkin Quest Case . . . In My Office! October 3, 2008: One Munchkin Quest Case . . . In My Office! Munchkin Quest, as you know, is the project that has eaten our brains (and time) for several months. Once you hold the box in your hands, and look at the amount of stuff inside, I'm confident you'll understand why this has been such a massive project for us. The good news is, we're almost at the end of the process. 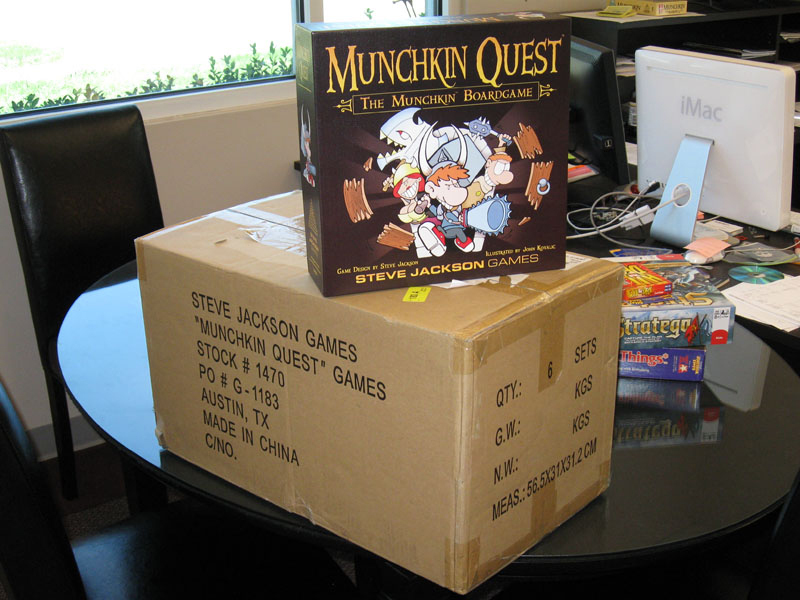 A single case of Munchkin Quest, as you can see in the photo, was delivered to us and immediately broken apart and distributed to those who most need a copy right now. Even though that case looks huge (which it is), it only holds six copies of the game. Munchkin Quest, on the boat and slowly making its way to our warehouse, is the game that's going to give our shipping guys some exercise. Sorry, guys, but all that stuff requires a big box.